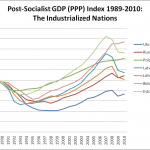 Was Russia In A Demographic Apocalypse In The First Place? And just as the Guardianistas and K.F. & Co. bury their heads ever deeper in the sand, real world statistics show confirm my thesis from the beginning of this year that Russia’s demographic crisis has for all intents and purposes come to an end. As of May there was a y-y increase of 17% (!) in births, a 2% increase in deaths, and virtually zero natural decrease; accounting for the entire Jan-May period, there was a 7.6% increase in births, a 2.2% decline in deaths (including an 18% decline in deaths from alcohol poisoning), and an overall population decrease of -57,000. However since natural decrease is typically biggest in Jan-May (see graphs here) the rest of the year may well see continuous natural population growth; it is also not beyond the realm of possibility that overall natural population growth, i.e. before accounting for immigration, will be positive in 2012. Still instead of the usual dry demographic update post I want to do something different here and delve into comparative and historical issues. For instance, now that we can pretty confidently say it has ended, how ultimately “bad” were Russia’s two lost decades? The Russian population peaked at 148.5mn in 1992. 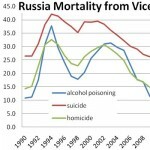 After that it declined at an increasing rate, especially after 1998 when the supply of ethnic Russian emigrants coming back from the Near Abroad dried up; then, in the mid-2000’s, it began to slow as core demographic indicators improved, and Russia started getting substantial numbers of Gastarbeiter. In retrospect stabilization was achieved in 2008, and since then Russia’s population rose for 142.9mn in 2010 to 143.0 in 2011 and 143.1/143.2mn this year. Peak to nadir this was a decline of less than 4% (or in chronological terms, 1985), with recovery already in motion. How does this compare with other transition countries? The Baltics. Estonia peaked at 1.57mn in 1990 and stabilized at 1.34mn in the late 2000’s according to estimates (decline of 15% and reversal to 1969); however, the 2011 Census showed that the actual Estonian population was 1.29mn (-18%; 1965). Nor was this just the effect of Russian “occupiers” leaving; native Estonians declined to 890,000 versus 963,000 in 1989 (-8%), or 970,000 in 1922 (in other words, the ethnic Estonian population hasn’t grown in a century). The statistics for the other Baltic states are worse. Latvia declined from 2.67mn in 1989 to 2.07mn according to the 2011 census (-23%; 1958). Again just to show that this isn’t an artifact of occupiers finally leaving the numbers of ethnic Latvians fell to 1.28mn from 1.39mn (-8%), and the current ethnic Latvian population is lower than it was in 1925. However what’s worse is following the global financial crisis Latvia’s demographic situation has become the worst in Europe. In Lithuania the population fell from a peak of 3.70mn in 1989 to an estimated 3.2mn; however, this estimate was as in Latvia’s and Estonia’s case proved to be far too optimistic by the 2011 Census, which showed a preliminary result of 3.05mn (-18%; 1967). Ukraine. Declined from a peak of 52.7mn in 1993 to 45.8mn in 2011 (though the Census, which was postponed to 2013, might show a different figure especially if emigration was underestimated as is quite possible). This translates into a decline of 13%, or a reversal to the population level of 1967. While it has shown promising signs of recovery in the late 2000’s its natural decrease of -162,000 in 2011 is higher than Russia’s -131,000 even though Ukraine’s population is three times smaller. Belarus. Declined from a peak of 10.24mn in 1993 to 9.47mn in 2011 (-8%; 1977). Not bad all things considered. It could have been Ukraine. Poland. The Polish population peaked around 38.7mn in the late 1990’s (it did not undergo a Soviet-style mortality shock because it is a very alcoholized nation) and since declined to 38.1mn in the late 2000’s before recovering slightly to 38.2mn by 2011 (presumably because of many emigrants coming back). As such the Polish population today is virtually unchanged from 38.1mn in 1990. Nonetheless these results are not based on Censuses and as well saw with the Baltics domestic statistics agencies may well have underestimated Polish emigration post-Schengen. Furthermore with a TFR that is steadily at around 1.3 for over a decade an acceleration in population decline would appear likely. Hungary. Declined from a peak of 10.7mn in 1980 to 10.4mn in 1990, 10.2mn in the 2011 Census, and an estimated 10.0mn today (maybe lower; we’ll know with the next Census). This is a decline of 4% since 1990, or 7% since 1980. It’s population was last at this level in 1961. Its TFR is currently at a “lowest low” level of 1.24, so for all of Orban’s exhortations, a quick reversal of this trend – evidence for over thirty years now – doesn’t seem probably. Bulgaria. Declined from 8.98mn in 1988 to just 7.64mn according to the 2011 Census (unlike most countries in this sample, the Census results showed a slightly higher result than predicted). This decline of 15% translates into population levels last seen in 1957. (Counting only ethnic Bulgars you have to go before WW2 to get the same population as now). Fortunately, like Russia, Ukraine, and Belarus (but unlike Poland, Latvia, Romania, and Hungary) the TFR has been recovering in recent years breaking 1.5 in 2009. Romania. Declined from 23.2mn in 1990 to an estimated by 21.4mn by 2010, this however was far too pessimistic as the 2011 Census showed the actual population to be 19.0mn presumably due to mass emigration post-Schengen. This is a decline of 19% to levels last seen in 1965. Czechoslovakia. As the richest and most successful of the transition economies, the Czech population has actually risen; it stagnated from 10.30mn in 1991 to 10.2mn in the early 2000’s, however since then it rose to 10.56mn presumably as a result of migration, an overall rise of 2.5% since socialism. Slovakia’s population from 5.27mn in 1991 to approximately 5.44mn by 2011, a rise of about 3%. Taking a fairly comprehensive survey of transition countries, we notice that Russia had the fourth smallest decline relative to its peak at less than 4%; only Poland, with a decline of 1% (albeit may rise as its been almost a decade since the last Census; the decade in which they entered Schengen), and the Czech Republic and Slovakia which showed overall population growth since 1991, beat it. What’s more Russia’s current TFR is actually higher than that of all the other countries in the survey and on current trends will rise to 1.70-1.75 this year accentuating the gap even further. How is it still feasible to talk of “drastic decline“? How is it still feasible to pretend that its demographics are a complete mess? It is not, of course. Not when the trends and figures most indicative of demographic potential are now better than almost all of East-Central Europe, as well as Germany, Japan, and the Mediterranean states.